I told Dale that our New Mexico trip didn't deserve a trip report, but some jotted scribblings are in order. Chris and Amy were getting married July 6 in Albuquerque, and we wanted very much to be there. My work schedule is tight, but July 4 counted as an extra day off. So we planned to fly to Albuquerque on Tuesday, July 2, go down to Cloudcroft to visit my parents for a few days, then come back for the wedding and depart on Sunday, July 7. Our troubles with this trip started on Wednesday, June 26. I looked at our flight confirmation, and discovered that our reservation had us flying back from Albuquerque on Saturday, July 6 - before the wedding began. I normally try not to swear, but I texted Lori a stream of simple profanity. Lori took on the job of rescheduling us, though it incurred an expensive change fee. But there were no flights back on Sunday; we had to reschedule for Monday. Then on the evening of Saturday, June 29, I came down with a fever. Over the next few days, I had phases of fever up to 103.8°F, and horribly embarrassing diarrhea. We went to an urgent care center on Monday to see whether I could get any relief, and whether I could safely fly. The doctor said it would probably last a total of 5-7 days from the first symptoms, I could fly if I felt up to it, and if Lori hadn't already come down with this, she probably was not going to. We weren't willing to risk flying early Tuesday morning as planned; we wanted some awake time to monitor my symptoms before flying. But we rescheduled (with another fee) to fly on Tuesday evening. I felt significantly better on Tuesday. Packing for the trip was a mess, because we were trying to pack for lots of contingencies and I wasn't much help. But the flight went smoothly. Since we landed near midnight, we got a hotel in Albuquerque instead of driving down then. We had a tasty brunch at the Frontier Cafe. 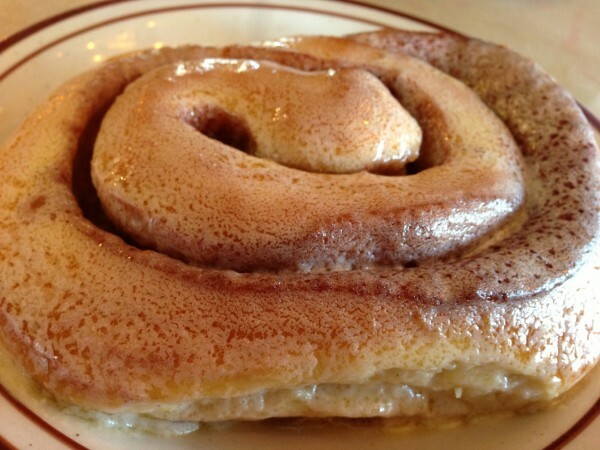 I really like this picture of the sweet roll, but I don't actually find the sweet rolls wonderful to eat. We arrived at my parents' cabin and were welcomed pleasantly. That evening, though, Lori started getting feverish. She went to bed early, but it wasn't enough to avert illness; she came down with the same disease I had had. Lori was horribly sick all day. We'd planned to go to the Mescalero Apache reservation for a roundup with rodeo and dancing - but we stayed home to take care of Lori all day. I did finish one project for Chris and Amy. In western Pennsylvania, it's traditional for weddings to include a cookie table, piled with an enormous variety of cookies made by the family and friends of the bride and groom. 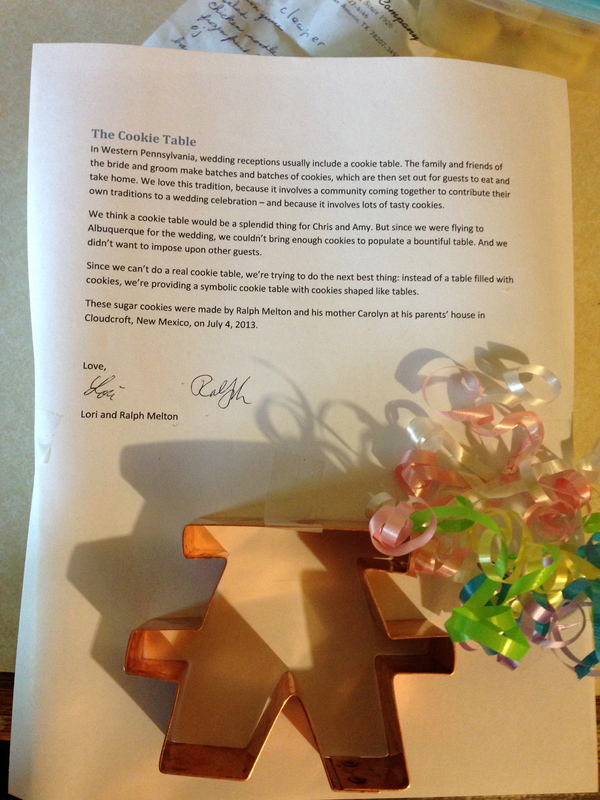 We would have loved to make a cookie table for Chris and Amy. But we couldn't bring enough cookies on the airplane, and we didn't want to impose on their family and friends. So we honored the cookie table tradition in spirit: my mother and I made a batch of sugar cookies in the shape of a picnic table. Lori was so sick that she didn't manage to stay awake to watch fireworks on TV. My cousin Allison had planned to visit my parents this day, but we called her and warned her not to come anywhere Cloudcroft lest she and her son encounter our germs. Lori was much recovered, so we drove back to Albuquerque. But once we got there, Lori felt sick enough that she just stayed in the motel room while I went off to dinner with a group of Roadfooders. Dinner was at Harry's Roadhouse near Santa Fe; it was very tasty. We both felt healthy-ish today, which was a very good thing, because we really wanted to attend the wedding in good spirits. We visited Jerky by Art, a carne seca shop for which I have a particular fondness. We ate lunch at Mary and Tito's, a New Mexican restaurant. The food was very good - the chicharrones were among the best I've had, the sopaipilla stuffed with carne adovada was very good, and the Mexican wedding cake was great. We went through Old Town Albuquerque briefly, then went off to the wedding. - The vows featured pledges like Amy's "I promise to listen to your heavy metal podcasts, even when I've never heard of the bands"
- Chris and Amy's first dance was the Hokey Pokey. - Because Chris is a Latin teacher, the wedding cake was a reconstructed Roman recipe, made with spelt flour and sweetened with honey. I liked it. - It rained heavily late in the evening - but in the high desert, that felt like a blessing. It was a great wedding, and we wish Chris and Amy every happiness. Lori was feeling under the weather again, though thankfully she didn't have a recurrence of the most distressing symptoms. After a very slow start and a snack at Golden Crown Panaderia, we went up to Santa Fe. We had lunch at Pasqual's - tasty but not the extraordinary splendor that Gregg had described. We shopped a bit near the Plaza, but Lori didn't have nearly the energy or enthusiasm for shopping that she normally would. 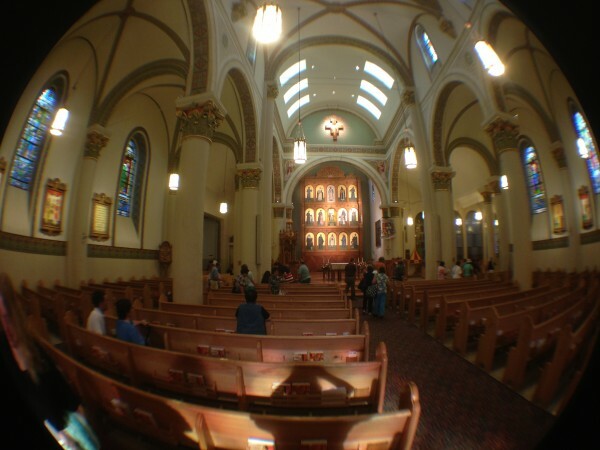 We attended Mass at St. Francis Cathedral in Santa Fe. As we were walking back to our car, someone tried to sell us a very nice vase at a piddling price. As we were declining, someone called out that he had just stolen the vase and the storeowner chased after him. We later met the storekeeper, who had recovered the vase - he said that the robbery was an attempt to get drug money. We ate at Harry's Roadhouse, because New Mexican food seemed too risky for Lori - very good food. More troubles: When we got back to the motel, our keys wouldn't open the door to the room. Nor would the desk clerk's master key. As he was bringing out the machine to reset the lock, another guy came along with the magic touch to get things working again. That night, the toilet in the room clogged again; I was tired and I hoped that time would relieve it, so we went on to sleep. When we woke in the early morning, the toilet was still backed up. So I went to the front desk to get it handled. The guy said that maintenance didn't come until 8am, and he handed me a plunger. I plunged the toilet successfully, but this was not at all the service I wanted. We had trouble getting moving to check out, but we made it work by shoving everything haphazardly into our suitcases. We stopped at the front desk to complain about our troubles with the room: the lock, the toilet, the non-working phone, the broken hair dryer. The assistant manager on duty offered to knock a bit off our bill - but then we realized that he was taking 15% off a rate that was higher than the special rate we had gotten. Once we pointed that out, he was friendly about correcting the error, but it meant more delay. Stopped at the 66 Diner for a so-so lunch. Flew home without incident. We made it to the wedding, and that was what was most important to us. But aside from that, it was one of the worst trips I can remember.